Any skywatchers whose hearts were set on a Camelopardalid meteor storm had their hopes dashed on Saturday morning: Most observers saw only a smattering of shooting stars when Earth passed through the trails left behind by Comet 209P/LINEAR. But Peter Jenniskens, the meteor astronomer at the SETI Institute who predicted the meteor shower years ago, is looking at the bright side. "I'm so excited that this shower actually happened," he told reporters. "It is one thing to predict there ought to be some dust there, but we had no information about this comet in the past." Jenniskens said he and his colleagues saw about 12 of the meteors overnight during a two-hour aerial observation campaign in the skies over California. The meteors are dubbed Camelopardalids because they appear to emanate from a little-known northern constellation called Camelopardalis (the Giraffe). "This sleep-depriving, bone-chilling, stiff neck inducing event of major disappointment brought to you by the same sadistic fiends who promised me that Comet Eyesore would be the comet of the century. Pfft! Phooey! Rats!" Some of the radar readings suggested that there were more faint meteors, too dim to be seen with the naked eye. And even if the display was disappointing, the most persistent observers were rewarded with striking photographs, as evidenced by SpaceWeather.com's meteor gallery. One of the best pictures came from Malcolm Park, who set up a battery of cameras on the north shore of Lake Erie at Ontario's Rondeau Provincial Park. 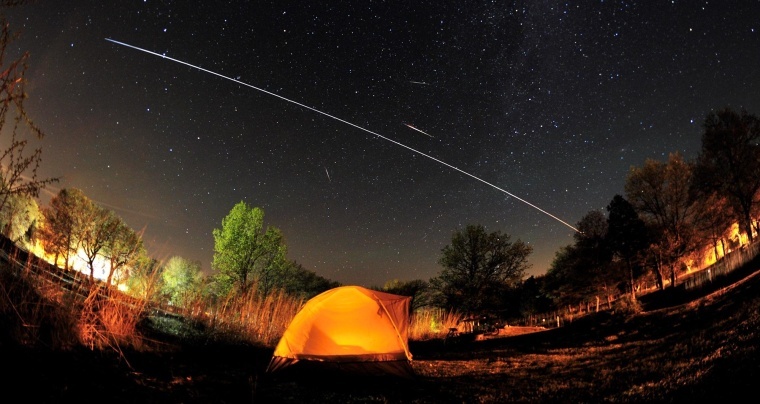 His composite image shows several Camelopardalids, plus a long-exposure view of the International Space Station passing through the scene at 3:30 a.m.
"While the pace was slow, this shower still produced the occasional bright meteor," Park reported on SpaceWeather.com. "Meteors were visible from sunset until just before dawn when the moon rose." For more about Park and his pictures, check out his website, his Facebook page and the home page for Starfest 2014, the star party he and the North York Astronomical Association are planning in Ontario this August. Even though there was no meteor storm, Jenniskens said it was wonderful to see the Camelopardalids from the air. One meteor in particular made for a "slow-moving, beautiful sight," he said. And the fact that the meteor shower was on the quiet side gave him some new scientific data to ponder. "It’s a little early to make conclusions," he said, "but it does look like this comet was a weakly active comet, much like we see it today, further back in time." Comet 209P/LINEAR is closing in on its own close approach to Earth on May 29, and if you've got a good telescope, you can see it for yourself. But if it's meteors you're looking for, the next best chance comes in August, when the annual (and reliable) Perseids hit their peak. Tip o' the Log to EarthSky's Deborah Byrd and Space.com's Tariq Malik.